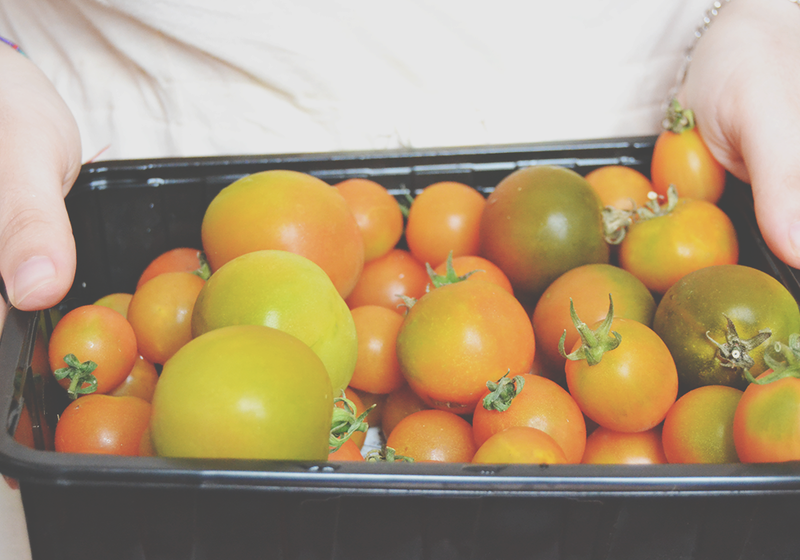 We are growing tomatoes in our garden and we are being able to harvest a lot of them lately, and even though we are having no sun this summer, they taste very nice and ten times better than the ones you buy at the grocery store. Especially the cherry tomatoes, my favourites! As you know, I’m trying to eat healthier so I’m testing out a few fresh healthy summer lunch to collect a few and write about them in the upcoming future, however I could not wait to share this recipe with you! 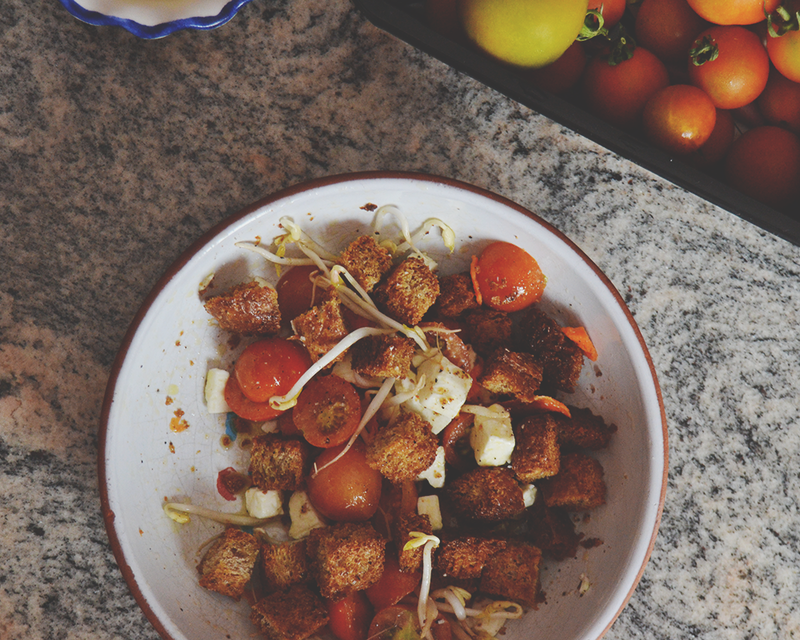 Since I tried it the first time it really became my favourite summer salad, so delicious and light but fulfilling and complete. 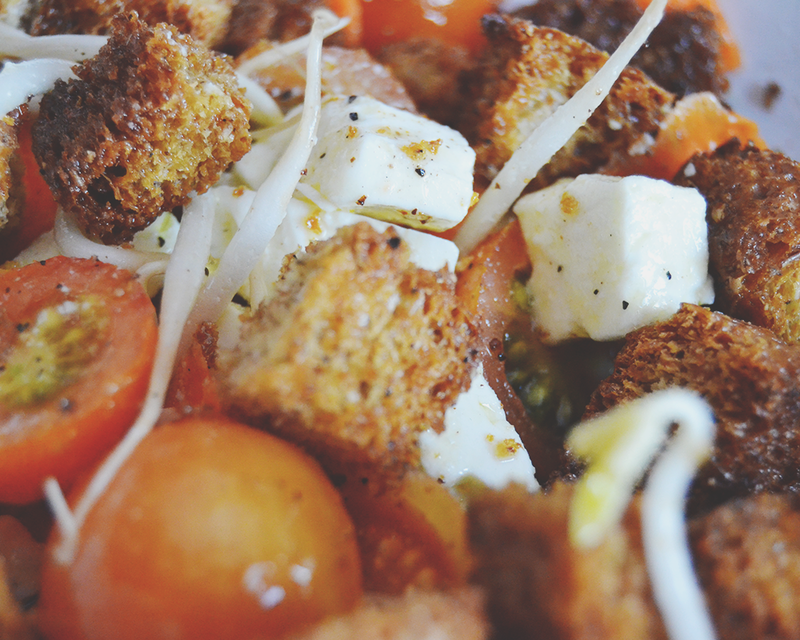 It was actually inspired by a lot of panzarella salads I found on the internet recently, but I decided to give it my very own twist and put together a salad with ingredients I love. 1. I like to start with the bread: preheat the oven to 180°C, cut the bread slice into tiny cubes, place them on a baking tin lined with parchment paper spreading them out on it, then top them with some olive oil, pepper and salt and place them in the oven for up to 10 minutes or until they start looking golden brown and very crisp on the surface. 2. Then take the bread out of the oven and leave it cool for a few minutes, meanwhile start cutting the tomatoes in half, slicing the carrot as thin as you can and chopping the feta cheese into little cubes, then mix them together in your salad bowl and start seasoning the salad with 2 teaspoons of fresh lemon juice, 1 tablespoon of soy oil and 1 tablespoon of olive oil, pepper and salt to taste, and mix well. 3. Then add the bread cubes and give it a last mix with a spoon. Done! This is so simple but delicious: I love how pepper and lemon juice really compliment all the flavors from this salad, and I also use it as an excuse to eat more carrots as I usually really dislike them (but placing them into a very rich salad is always the best way to cover the flavor but actually eat them!). It’s fresh and rich of flavors and different textures, plus it really gives you a balanced amount of carbs without overdoing. This is such a customizable salad and you can definitely add whatever you like the most! I’m not a fan of leaves so I usually tend to just leave them apart. However if you feel like adding some more flavors, try to not overdo with every of them because, even if it doesn’t look so, this is very fulfilling and if I go a bit overboard I rarely can finish it all! 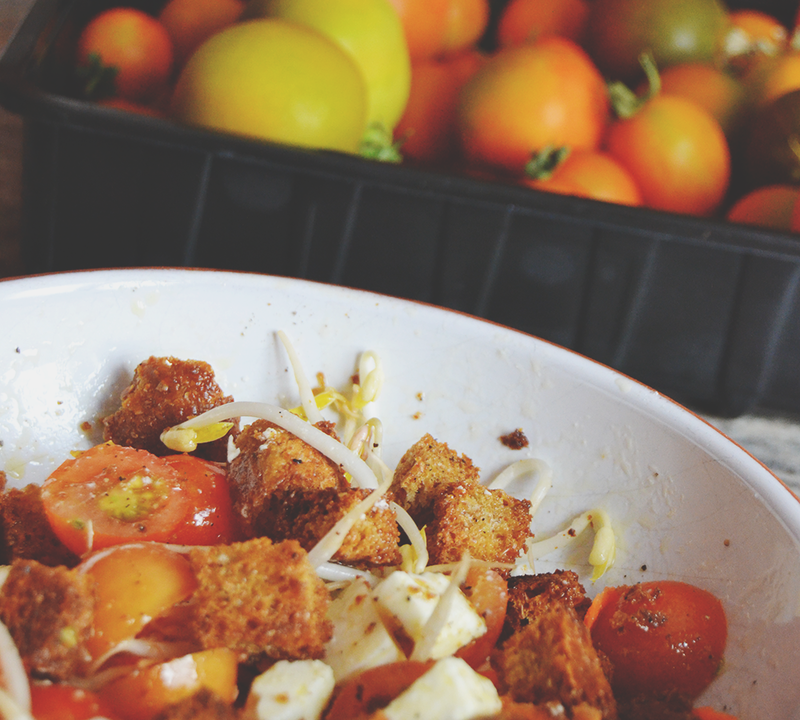 What about your favourite summer salad? I’m not a massive salad person but this does look really nice! 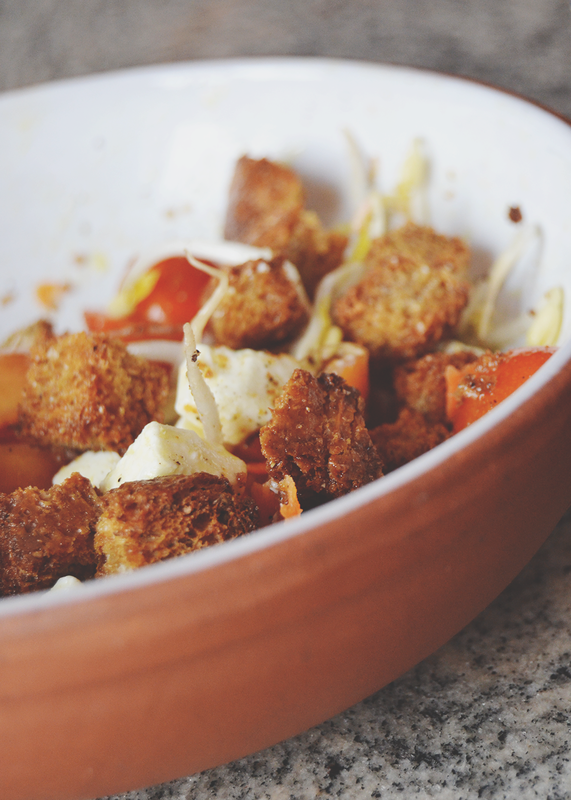 Especially the croutons. Yum. This looks really nice, I like the addition of the bean sprouts, I might have to add these to my salads.